Write on the board: Holocaust – when? who? where? what? why? how? Ask students, in small groups, to discuss the questions for 10 – 15 minutes, to see how much they know. You could allow them to use phones / tablets to access the internet if you like. Elicit answers and tell them it’s Holocaust Memorial Day on 27th January and that we need to remember the Holocaust so that it never happens again. Ask learners to read the short text about the Holocaust in this link and try to remember all the important facts. They can have time to discuss in pairs which facts they think are most important. Then click on the link to the quiz under the article and get the class to do the quiz to check what they remembered. If necessary, they can read the text again, or access the text on their own phones / tablets / computers. Ask if the class know any films about the Holocaust, and why they think many films have been made about it. What do you think the story of the film is? Who do you think are the main characters? Tell learners they are going to watch 3 film trailers and then write their answers to the 3 questions for each of the films, in pairs. At the end, they will read what the other pairs have written and anyone who has seen the films can decide which version is closest to the truth. (If no-one has seen the films, you could look up summaries online. Alternatively, you could choose to use only one or two of the trailers). Play the first trailer, then give pairs 10 – 15 minutes to write their answers. Repeat with the second and third trailer. Blu-tac all the writing to the board / walls of the classroom. All the learners stand up to read them. They select which is closest to the truth, and you can select some common errors and elicit corrections. What has the world learnt from the Holocaust? 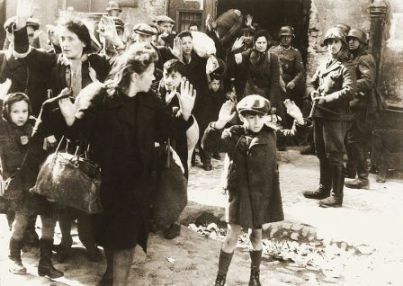 Which situations share similarities to the Holocaust in the world today? What can we do to stop the Holocaust happening again? Learners, in groups of three, discuss the 3 questions and make a poster to put up on the wall. This unit was created by Linda Ruas, GISIG Joint-Coordinator. 1. What occurred on Jan. 27, 1945? Why was that date chosen to mark Holocaust Memorial Day? 2. Ask students to search the etymon, the origin of the term ‘Holocaust’, originally a Greek word in the Septuagint, the ancient Greek translation of the Hebrew Bible. 4. Another word applied to the Nazi Holocaust is ‘genocide’, also based on Greek, coined in 1944. What does it mean? Are there examples of genocide ongoing today, reported in the news for all to see? Ask students: what is ‘ethnic cleansing’? 5. What was the most notorious Nazi concentration camp, and what do students know about it? 6. What do students know about the Holocaust in their own country? 7. What is anti-Semitism and what do students know about it? 8. The Nazi racist-biological ideology singled out the Jews for mass annihilation and one other ethnic group, still widespread across Eastern Europe, often very poor and marginalized, with many migrants today in Europe’s West. What was that pan-European group and what do students know about them in the Holocaust, and today? 9. In one country in southeastern Europe, Bulgaria—an ally of Nazi Germany in the fascist Axis during WW II—the entire Jewish population of some 50,000 Jews were rescued from mass murder during the Holocaust. This was by the actions of a group of politicians in the Parliament, several key bishops in the Orthodox Church and many ordinary simple people, along with Tsar Boris III, the Bulgarian monarch. Students can watch on their own (2:22 min. in toto). Many memorable scenes and based on a true story of actual prisoner revolt and successful escape. Much to discuss. The transport train arrival scene with prisoners (min. 4:20-17:25) is shattering to watch, an iconic sequence, extraordinary images. It makes for an intriguing Holocaust cinematic focus. And underlines Jewish resistance inside a brutal camp on Polish soil to the horrors of WW II. A very useful IATEFL webinar by Margarita Kosior in November 2017 centered on teaching about the Holocaust with direct reference to the Maidanek concentration camp, which is adjacent to her native hometown of Lublin in eastern Poland. Margarita also utilized the film THE BOY IN THE STRIPED PAJAMAS as a key part of the lesson for her students. Also very useful is this special focus 2016 on HMD, by Margarita Kosior and associates: http://gisig.iatefl.org/resources/elt-for-social-justice-addressing-the-issue-of-the-holocaust Much intriguing input there, including reactions from students in Greece and Lublin. Leonie (an actor in the UK) is the granddaughter of Werner Scholem, murdered at Buchenwald concentration camp in 1940 as a high-profile ‘Jewish communist’ (https://en.wikipedia.org/wiki/Werner_Scholem ), the older brother of the famous Israeli expert on Jewish mysticism, Gershom Scholem . Both brothers were born and raised in Berlin. Leonie’s penpal Viktoria in Germany turns out to be the granddaughter [!] of Baldur von Schirach, head of the Nazi Hitler Youth. Incredible the two granddaughters of these diametrically opposed men becoming, in time’s uncanny and healing undulations, long-time friends.